Jacob Broom is most frequently remembered as one of the signers of the US Constitution. However, this event encompassed only a few short months of his 58 years. Because of the various roles he played in business, and in national, state and local politics, more information on Jacob has survived the past 200-250 years than might be expected for the average citizen of the 18th century. This story is a modest attempt to get further than the Constitution and look at the person and family of Jacob Broom. 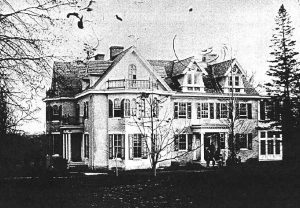 Photos of Hagley House, built by Jacob Broom. Photos courtesy of Hagley Museum & Library, Wilmington, DE. 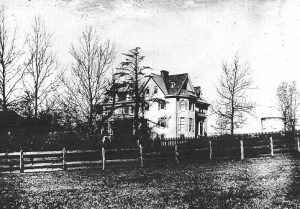 These photos date to approximately 1885, 90 years after Jacob built the house. It was sold to the DuPont family in the beginning of the 1800’s. 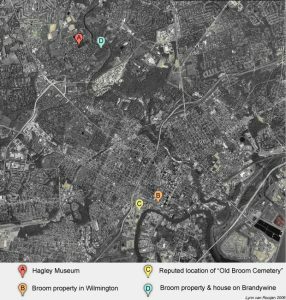 Jacob Broom was born in Wilmington in the summer or fall of 1752, probably October 17th according to a marriage record. His parents were James Broom and Esther Willis. James is often referred to as a “gentleman” and as a “blacksmith turned farmer”. Certainly by the time of his death, he possessed considerable property, including significant acreage, some of it under cultivation, but farming or blacksmithing was certainly not his only form of livelihood. On the contrary, during Jacob’s early years, James, like his father before him, placed advertisements in the local papers indicating that he owned and operated a tavern providing “entertainment for man & horse”. He was also involved in buying and selling land, an interest that he passed on to son Jacob. Esther Willis’ parents and grandparents were members of the Society of Friends, and were some of the earliest settlers of SE Pennsylvania. James and his parents, however, had been members of St. Paul’s in Chester, although James’ mother was originally a Quaker. 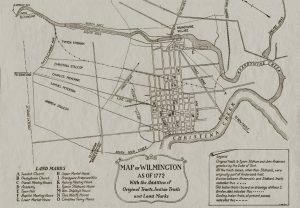 Grandfather Thomas Broom moved to Wilmington in the late 1720’s or early 1730’s and it is likely, but not certain, that James moved there with him at that time. James could have remained behind, certainly if he had been serving an apprenticeship with one of his neighbours in the Concord area. Esther was still living in Thornbury at the time of her marriage, raising an interesting point in itself: exactly when did Jacob’s parents marry? The most often-quoted story places their marriage in 1750, and names Jacob as the oldest child. However, Esther’s mother wrote her will in 1743, and left a bequest to John Broom, son of Esther and James. This means that their marriage most likely took place in 1740, and John was probably born in 1741 or 1742, possibly in Pennsylvania instead of Delaware. Was John still alive when Jacob was born? Unfortunately, there seem to be no birth or death records for any of James’ and Esther’s children, perhaps a result of their “mixed” marriage. We then seem to have a 10 year gap before Jacob’s birth, very unusual in those times. Grandfather Thomas Broom does not mention any grandchildren through James in his will in 1749, although he does mention some of his other grandchildren. In 1759, Jacob Taylor mentions “friends Esther, Jacob, Isaac, and Abraham Broom” in his will and makes James his executor. While this Esther could be either mother Esther or a daughter of the same name, the will suggests a son Isaac, born in between Jacob and Abraham. There was no mention of a John, suggesting that he had died prior to 1759. By the time James died in 1794, it would appear that only Jacob and Abraham were still alive. Alternatively, there could have been a split in the family, perhaps along religious lines. An Isaac Broom, not a particularly common name at that time, is mentioned in the 1790 Bucks County census. However, no connection with James Broom has been proven (or disproved) as yet. Back to Jacob. We will perhaps never know for sure if there were several or only two children in the Broom family in the 1750’s. However, by the time Jacob was born, the family was definitely living in Wilmington. James had placed several ads offering his deceased father and mother’s property for sale in 1750 and 1751. It is not clear if he resided on Market St. himself at that time. By the late 1750’s, however, the family was most definitely living in that area and running a tavern, described in an advertisement by James (in the 3rd person) as a new “three Story House, below the lower Market house, at the Sign of the Sloop, where he continues to keep Entertainment for Man and Horse, as usual, and requests his Friends, and others, to favour him with their Custom”. This and the other ads placed between 1750 and 1771 for lost & found horses and meetings to be held at the Broom house or tavern, paint a picture of a lively, bustling house, with travellers and other customers coming and going at all hours. We can almost see a very young Jacob peering out from behind the skirts of the domestic servants, not missing a thing. He continued: “TAKES this Method to acquaint the Public, that he was regularly instructed in the Practice of Surveying and Conveyancing, and is now determined to follow it with the closest Application, and hopes to give general Satisfaction, to those who may be pleased to employ him; they may depend upon having their Business done authentically, and with the greatest Care, Secrecy and Dispatch. Any Person, wanting to place out Money at Interest, may be assured that he will procure them undoubted Security, be Mortgages, or otherwise. Said BROOM, upon Application, will peruse and examine Titles to Lands; &c. and inform the Possessor or Owner of the Deeds, relating to such Lands, of any Defect in their Titles, also what will be needful to remedy or supply such Defect. “. The family apparently owned a significant portion of the land between Front and 3rd St, bordering on Market, as well individual lots and land outside of the city. 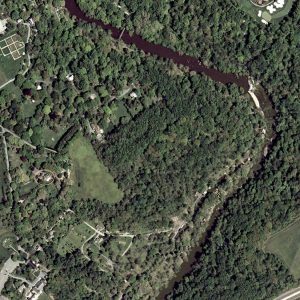 This quite likely was a portion of the property mentioned in grandfather Thomas’ will, and was being split up into smaller lots over time. Some was kept in the family, and it is here that Jacob also started his first businesses and was still living at the time of his father’s death. David Bush, mentioned in the ad, was in fact Jacob’s uncle, having married James’ sister. 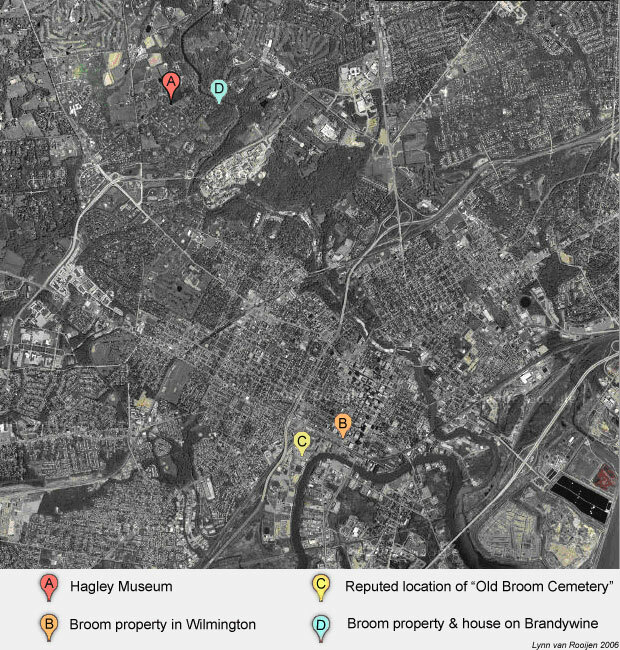 His location could also have been part of Thomas Broom’s legacy. In 1773, shortly after he opened his first business on Market St., Jacob married Rachel Pierce. By this time, James seems to have overcome his religious dilemmas and was openly associated with Old Swedes Church. It is possible that Esther had died by this time. We do know that she was not mentioned in James’ will and so probably died before 1791. Jacob’s children Ann (Nancy), James Madison, Esther and Sarah followed in short order as evidenced by a belated baptism of several of the children in 1784. This record also contains a note that a daughter Elizabeth had been baptized in 1777. She had presumably died in the meantime as another Elizabeth is baptised in 1784. Jacob is listed as a Vestryman of Old Swedes Church in 1784. Children Jacob Pierce, Rachel Maria, Lavinia R and Nicholas Way followed between 1785 and 1793. Of these children, Nicholas Way, who was named for James’ cousin, the well known doctor Nicholas Way, also probably died very young. It seems that Jacob & Rachel had ten children and not the eight commonly mentioned. However, only eight of them reached adulthood. During this period, Jacob had not stood still in his business and political life. 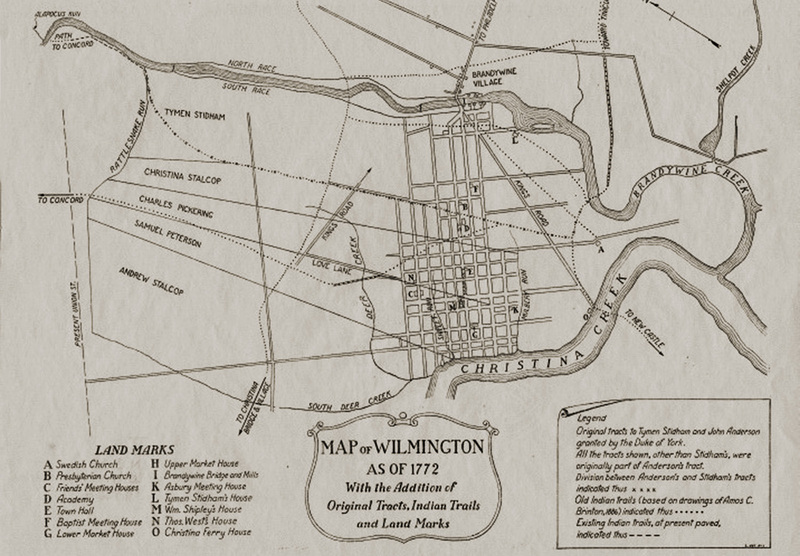 In 1776, at the young age of 24, he was elected Second Burgess of Wilmington. He served in this function and also that of Chief Burgess several times over the years. During this period, his advertisements began to change accent slightly, placing more emphasis on securing money for mortgages and on the sale of land instead of his surveying business. However, Jacob did draw some of the maps used by George Washington in 1777 at the Battle of the Brandywine and a few other maps of his are reputedly still housed in various museums. 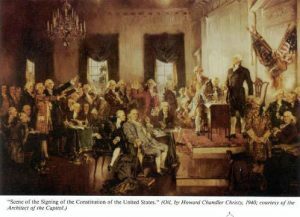 Scene at the Signing of the Constitution by Howard Chandler Christy. For this painting, Christy consulted earlier paintings, sketches and written descriptions to determine each signer’s appearance. Likenesses or descriptions of two signers, including Broom, could not be found, so their images were left obscure. Click for larger view & legend. Please note: the image of Jacob Broom below on the 1978 “first cover” is also only an artist’s fantasy, based on the general appearance of men at the time. Jacob also served in the State Legislature from 1784 – 6 and in 1788. In 1787, he signed a petition to abolish slavery, although a later census shows him to have had a slave in the household, in addition to several free servants. 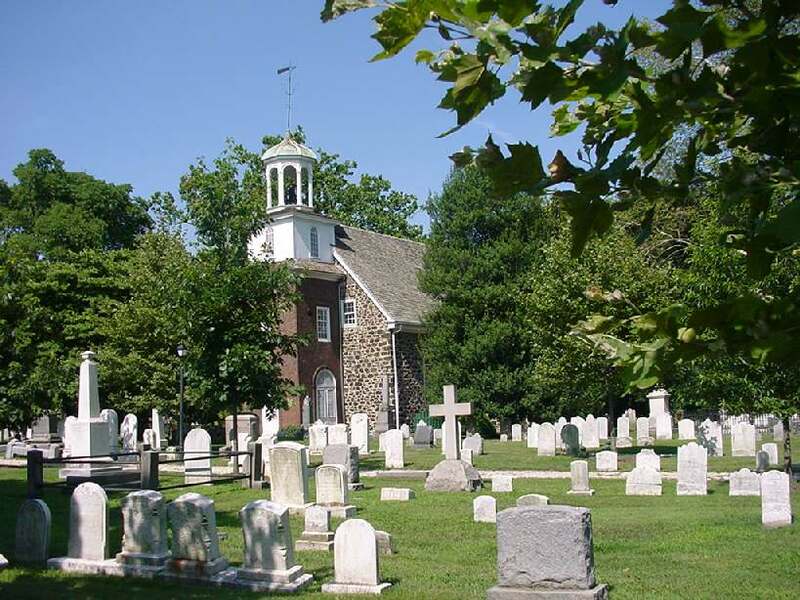 Jacob had been chosen to attend the Annapolis convention, but like many, was unable to attend. Later, he was again selected to attend the Constitutional Convention and the minutes indicate that he never missed a session. Jacob Broom was, in his mid-thirties, one of the youngest delegates at the Constitutional Convention. Jacob seems destined to be remembered as having played a modest role since he did not often take the initiative in discussions and did not often take the floor. While this is certainly true, a careful reading of James Madison’s notes of the convention do allow for some nuances. 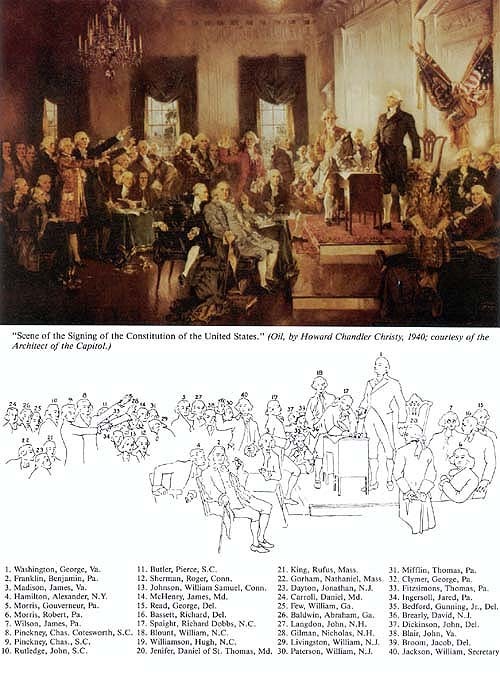 The Delaware delegates were sent with at least one “mission”: to ensure that the wealthier “little” states were not bereft of their voice in the federal government because of their smaller size. Firm words that also attest to a feeling for give-and-take. Somewhat later, when the point had been largely won, Jacob can be seen to soften his standpoint on some other issues in recognition of the concessions of the larger States, a capacity that set an example for some of the other delegates at times. Reading these pages, I have formed a somewhat different picture of Jacob Broom’s role: certainly modest and of someone not concerned with focussing attention on himself, but certainly not one of a passive spectator. On the contrary, he seems to have listened intently, formed his own vision, and kept quiet as long as things were going in the “good” direction. However, he frequently supported a speaker’s standpoint to give it emphasis, stated his opinion at appropriate moments in the discussions and did not give up on points that were important to him. At the same time, he showed himself to be flexible and able to find the important balance between the desire to win a point at all costs and to reach a goal that perhaps had moved a bit during the journey to reach it. After the convention, Jacob Broom returned to Wilmington, where in 1795 he erected a home near the Brandywine River on the outskirts of the city. One of Broom’s primary interests remained local government, however. 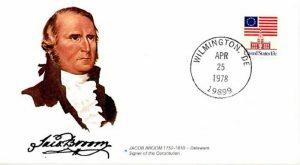 In addition to continuing his service in Wilmington’s government, he became the city’s first postmaster (1790-92). For many years, he chaired the board of directors of Wilmington’s Delaware Bank. He also operated a cotton mill, as well as a machine shop that produced and repaired mill machinery. He was involved, too, in an unsuccessful scheme to mine bog iron ore. A further interest was internal improvements: toll roads, canals, and bridges. A letter to his son James in 1794 touches upon a number of these pursuits. Jacob Broom also found time for philanthropic and religious activities. His long-standing affiliation with the Old Academy led him to become involved in its reorganization into the College of Wilmington, and to serve on the college’s first Board of Trustees. Broom was also deeply involved in his community’s religious affairs as a lay leader of the Old Swedes Church. 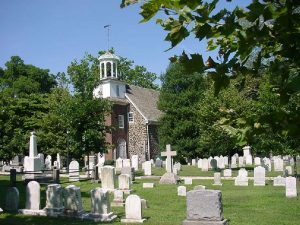 He died suddenly at the age of 58 in 1810 while in Philadelphia on business and was buried there at Christ Church Burial Ground. The exact location is not known, but a memorial marker has been placed in the cemetery to commemorate the fact. His grandson and namesake–and my gggrandfather– Jacob Broom Lyon, was just three years old at the time. Sources: “Life & Character of Jacob Broom” by Rev. William W. Campbell, Historical Society of Delaware, Wilmington, 1909; “Soldier-Statesmen of the Constitution” by Robert K. Wright, Jr. and Morris J. MacGregor, Jr., Center of Military History, United States Army, Washington, D.C., 1987 & McCullough & Lyon Family papers, extensive internet research, documents from various historical societies & notes.